This is an adaptation of the fantastic StockFish application that can communicate with the ChessApps application. StockFish is the best free chess engine in the world. We can run this application from ChessApps by just pressing a button. The application will begin to analyze automatically the position on the ChessApps board. When we are satisfied with the depth of the analysis we can press the button “ChessApps OK” and ChessApps will open automatically with the variation analysed by Stockfish written on the variation panel. We shall be able to reproduce the movements of the variation on the board, playing the moves or using the button that calls “StockFish”. We can also add Informator type symbols on any of the moves, shorten the variations and finally incorporate them to the book or simply delete them. 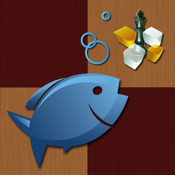 You need to install both free apps: ChessApps and stockfish for ChessApps. CA begins the SF execution in analysis mode, for the position that CA had on the chess board. SF begins the CA execution and passes over the analyzed line. CA interprets the line and reproduces it on the variations panel where the user can edit it, add position or evaluation symbols, delete moves and finally add it permanently to the book or discard it. 2. SF gives the two best analysed lines instead of just one. The user chooses which one should be sent to CA. 3. During the analysis the best move is indicated and answered by means of a blue and red arrow respectively. 4. The moves panel, both in “analysis” mode and “play” mode, shows the current move with a yellow background. 5. The moves panel is interactive: if a move is touched the position is changed to the new position obtained after the move. The original version only allows the user to scroll in the move list step by step (by the gliding effect of the finger from left to right on the list ) but it doesn’t allow the user to go straight to a specific move. 6. In analysis mode an “analogical” counter is displayed” with the evaluation of the position and the depth of the analysis.